Quit the Waves Nx app in case it is open. Extract and run the WavesHeadTracker application. 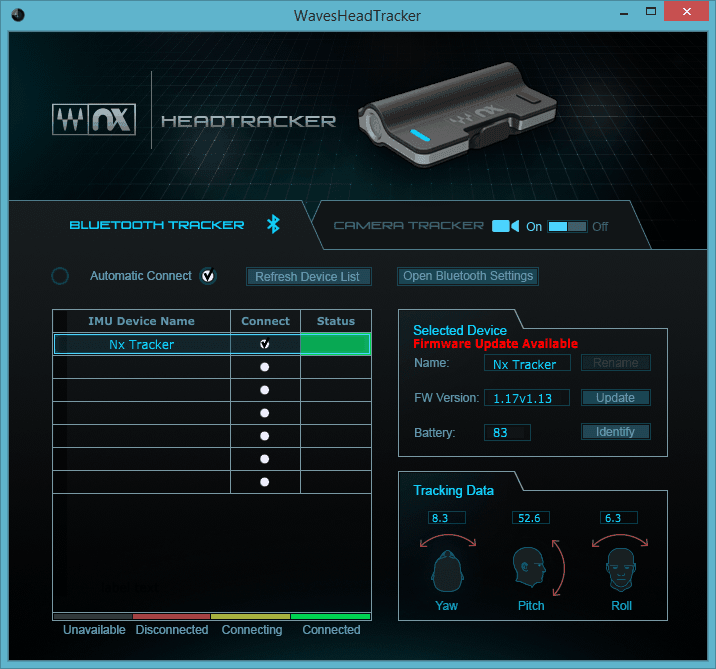 Turn on your Nx Head Tracker device, look for the device in the “IMU Device Name” column of the WavesHeadTracker application, and checkmark your device under the “Connect” column. Check that the firmware version on the device is 1.17v1.13. You will see a red text indicating that a Firmware update is available. Press “OK” to proceed to the firmware update. The Nx Head Tracker device will restart itself with a green light, indicating that it is in update mode. The WavesHeadTracker application will automatically connect to it and start flashing the firmware. You will see a progress bar indicating progress. The update will require a few minutes to complete. The dialog will indicate that the update has succeeded. The Nx Head Tracker device will then automatically restart. Its LED will turn blue. You will now need to reconnect the device (repeat the same actions as in Step 4 above). Once the device is reconnected, you will see the firmware version number change to 1.19v1.13. Pair the "Nx Update” device through the Bluetooth Settings menu in order for the firmware update to start. Once the “Nx Update” device is paired, the WavesHeadTracker application will start updating the firmware. You will see a progress bar indicating progress. The update will require a few minutes to complete. The dialog will indicate that the update has succeeded. At this point go back to the Bluetooth Settings menu and un-pair both the “Nx Update” and the “Nx Tracker” devices. Restart the Nx Head Tracker device by pressing the button (long press to turn off, short press to power back on). Pair the Nx Head Tracker device again in the Bluetooth Setting menu. Once paired again, you will see the firmware version number change to 1.19v1.13. Once the Nx Head Tracker’s firmware is updated to 1.19v1.13, turning off the device (long button press) will send the device to sleep (indicated by the LED flashing red). In this mode, the battery should last over six months. If the firmware update fails or gets interrupted in the middle, the device will default back to the firmware version it had before. In such a case, please retry to update. You can only update one Nx Head Tracker device at a time. During the update, make sure that no other system is using the WavesHeadTracker application in close proximity. Two nearby systems using the application at the same time might interfere with one another.